Can we manage to hold on to our dreams when those we trust in the most let us down? Can we forgive those we love when they've done something to break that trust? 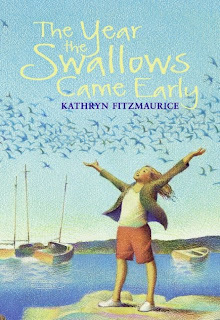 Kathryn Fitzmaurice explores these issues in her first novel, The Year the Swallows Came Early. These issues are heavy, but Fitzmaurice explores them in a way that's perfect for children on the verge of becoming young adults, our "tweens" trying to figure out the world around them. NY: HarperCollins, 2009. 277 pages. Eleanor "Groovy" Robinson is eleven years old and dreams of going to culinary school. Her greatest passion is creating the perfect menu for an exact feeling or event. Her grandmother even left her an inheritance that she was going to use to follow her dream. But then one day, "things that look just right come undone quicker than the last day of summer." That day, her father is taken away to jail right in front of her. When Groovy finally is able to sit her mother down to talk about why this happened, she finds out that her mother actually called the police. It turns out that Groovy's dad had spent the $25,000 that her grandmother had left her -- money that Groovy was planning on using for professional cooking school. Can you imagine the anger and sense of betrayal that Groovy must feel toward both of her parents - first, at her mother for calling the police, and then at her father for spending her money? The characters in this story, especially Groovy and her friends, are drawn in a realistic way that really gives a true sense of their emotional lives. This is a soft, understated story that nestled in my heart. Although it deals with big issues, it does so in a way that I think is very accessible to kids. Although Groovy's life is turned upside down, she learns to rise and fall with it. She doesn't forgive her parents right away, but she discovers the love that they really do have for her, even though they aren't perfect. People aren't just good or bad - they're a mixed up bag of both. And she learns that she can forgive. I would definitely recommend The Year the Swallows Came Early for kids in 4th through 6th grade who enjoy realistic fiction, like Because of Winn-Dixie or Ruby Holler. This book is on order for the Oakland Public Library. You can find it at Amazon and your local independent booksellers. To get a sense of what the book is like, click on the widget below from the publishers and read the first few chapters online. The ocean has fascinated people throughout the ages. I remember as a child watching Jacques Cousteau's television specials and being enthralled. There is something almost magical about undersea animals. Their lives are so far away from ours, so different and yet so graceful. 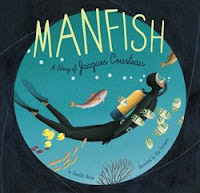 I'd like to recommend three books about sea creatures: a biography of Jacques Cousteau and two poetry books. Even as a little boy, Jacques Cousteau loved the water. He dreamed that he could fly underwater. He was also fascinated by machines, taking apart and inventing all types of gadgets. As a young man, he started to dive underwater, but he wanted to stay under water longer than just one breath at a time. So he invented the aqualung to help him breathe under water. "Below the surface, Jacques swam and glided and dove. He did flips and somersalts. He stood upside down on one finger, and laughed bubbles into the sea." 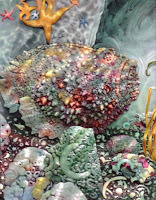 The beautiful illustrations in Manfish will enchant readers and invite them to learn more about our ocean life. As Jacques explores the depths of the ocean, readers open a verticle double spread, so they get the feeling of diving deep, deep down into the ocean. Perfect for kids in 1st and 2nd grade. CA: Harcourt Brace & Co., 1997. 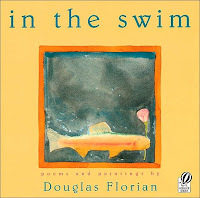 Kids will laugh at the different poems and paintings Florian creates. Another favorite explains the sawfish: "My spendid saw's/ for goring fishes-/ I eat them raw/ And don't do dishes." For a fuller look, check out Google Books where you can preview some of the artwork with their poems. 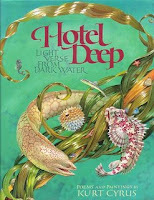 Hotel Deep, Light verse from dark water, provides a different poetry experience of ocean animals - a bit more complex, but also very evocative. Kurt Cyrus paints detailed scenes of ocean life, full of action and movement. Hotel Deep contains 22 linked poems that loosely tell the story of a sardine that has been separated from the rest of the school of fish, and now explores the ocean deep all by himself. Here is a favorite of mine. The sardine is swimming past some rocks on the ocean floor. overgrown with crust and week. You can see I'm just a stone. Not a stonefish. No, indeed! I'm as harmless as a bubble. Who could be afraid of me? Trust your eyes. I'm just a stone. Come in closer. Then you'll see. Kids will love pouring over the paintings in this book, finding all the hidden surprises. I found it a little hard to follow these poems as a clear story of what happened to the little sardine, but they did contain lots of fun surprises. The poems worked much better when I dipped into individual ones and shared them with kids. Love nonfiction? Check out Nonfiction Monday - today it's hosted by Simply Science. Action, adventure, cool gadgets and exciting death-defying missions - what more can a kid want? Zac Power has been my 2nd grade daughter's favorite series this year. It's the perfect hook for any reluctant reader in search of a new series. Feiwel and Friends, 2008. 96 pages. Zac Power's family works for the G.I.B. : the Government Investigation Bureau. Zac and his family all work to help solve international crimes in death-defying missions. In this episode, the first of four published in the U.S., Zac must track down Dr. Drastic, an evil mad scientist, before he sells Solution X to the world's government. What is Solution X? Boil the poison from poison dart frogs, add a few secret ingredients, and you have a super secret cure for every type of disease that ever existed. Now Dr. Drastic is going to blackmail the world's governments, charging them one million dollars each for the recipe! "Zac took a flying leap out of the airlock and into the black night. A split second later, Zac was falling at 200 miles an hour. Wind rushed past him. It roared in his ears. It sucked his cheeks back hard against his skull. Zac tugged his rip cord and his parachute opened. This book will appeal to 2nd and 3rd graders who love action and adventure, but want a shorter book. I think it would be fantastic for reluctant readers. Sometimes the vocabulary is a bit advanced with Zac's crazy gadgets (book two is all about an amphibious submersible vehicle). But the story and adventure will carry them through. It would also be a fun read-aloud for kindergartners and 1st graders. Check out the website for more gadget info: www.zacpower.com It's great for kids to explore. This series was originally published in Australia, but is slowly being released in the U.S. Find it at Amazon. A special thanks to Doret at the HappyNappyBookseller for these copies (check out her recommendations - she has excellent taste in children's books). You made my 7-year-old's day when she discovered these on my desk. She's clamoring for the rest in the series - I think I'm going to have to find a friend in Australia to send them to us! Middle school students are in the process of creating their own identity, thinking about their friendships, and trying to figure out who they are as individuals. After Tupac and D Foster tells the story of three friends and their search to see who they are in this confusing world of ours. NY: Putnam Juvenile, 2008. 153 pages. After Tupac and D Foster won the 2009 Newbery Honor Award, and it will appeal many kids in middle school. This book has an amazing voice. Told from a first person point of view, the author brought me into feeling like a 12 year old girl struggling to understand herself, made me remember what it felt like to try to understand myself, my friends, my Big Purpose. At its heart, it's a story about friendship. D Foster comes into the main character's life just a few months before Tupac gets shot the first time. D's foster mom lets her roam, and one day she appears on Neeka and the narrator's block. Over the next two years, the three girls (Neeka, D, and the narrator) develop a strong friendship - they become Three the Hard Way - and share their love for Tupac and his music. "How could I explain even a little bit of this to Mama - how some days D smiled at me and felt like my missing half. ... D was home to me and Neeka. D was ask me no questions and I'll tell you no lies. She was sun and crazy loud laughter and warm rain." But D disappears just as suddenly as she appeared. And Neeka and the narrator have to come to terms with that. Tupac is shot, and D is gone. But they'll both be part of their lives forever. In the end, I found that the big message was that home is where people love and accept you for who you are, even if your story has missing pieces. I think this book will attract kids who like realistic stories, who are grappling with family and friendship issues - perhaps some 5th graders, but definitely middle school students. The added texture of the friends' love of Tupac will appeal to kids who have used music and lyrics to help them figure out their lives and struggles. Would you like to read part of this book? Look at it on Google Books for a limited preview. Find it at the Oakland Public Library or the Berkeley Public Library. It's also available at bookstores near you and at Amazon. Spring is here in California, and the children are playing outside. What better time to read a book exploring the world of butterflies. Young children, especially ages 4 to 6, love learning about the life cycle of butterflies, and this book is a beautiful introduction. San Diego: Harcourt, Inc., 2001. As you begin this book, you see a close-up of plants in a field. Eggs are hidden from view; then you turn the page and discover the tiny hidden gems. Turn the page again, and the caterpillars hatch, creeping and chewing the leaves. Ehlert is a wonderful artist and poet, bringing suspense to her young audience as they follow the caterpillars changing into chrysalis, and then emerging as butterflies. body and wings take shape within. wings unfold; new butterflies are born!" The artwork is truly captivating, with color-rich pages that draw you into the small world of these creatures. My five-year old daughter especially loved the pictures and descriptions of the butterflies eating, sticking their long tongues into the flowers. We both spent a long time looking at the end section which details the different butterfly and flower species in the book. It's a wonderful blend of science, art and poetry - a perfect discovery for a spring day. Find it at the Oakland Public Library or the Berkeley Public Library. It's also available from your local bookseller or Amazon. Looking for more great nonfiction books for your kids? Check out Nonfiction Monday, over at Mommy's Favorite Children's Books. What is it that we hope for when we think of our daughters? That they grow up to be strong young women? That they find joy in the every day things of life? That they can weather the storms that we know are coming? How do we express our hope for our children? These questions float around in all parents' heads. But Neil Gaiman has turned these thoughts into a wonderful poem. 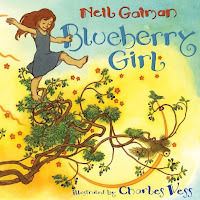 Gaiman wrote a lovely poem Blueberry Girl for a good friend who pregnant and having a daughter. Now he has published it, with beautiful illustrations by Charles Vess, as a children's book. This poem is an ode to a mother's hopes for her daughter, but it's written in a lyrical way without being too sentimental or gooey. The rhythm of the poetry is beautiful - listen to Gaiman reading it in the video below to get a sense of how well it flows. Grant her the wisdom to choose her path right, free from unkindness and fear." The best way to get a sense of the book is to listen to Neil Gaiman read it himself. Check out this video, with illustrations from the book and Gaiman reading it. Find a copy at the Berkeley Public Library or the Oakland Public Library, or order it at Amazon. It's really a beautiful book, and would make a great present for any mother-to-be. Do our kids need more action with zip-zap-zoom in what they read than we did? Or have young kids always needed books that delivered a quick punch? It's hard to know how video games and quick-action TV have changed our learning and reading styles. In any case, I think kids ages 7 to 9 will enjoy the Joe Sherlock series by Dave Keane. It packs a lot of laughs along with satisfying quick mysteries. NY: HarperCollins, 2006. 116 pages. "Basically, a burf happens when you burp so big and throaty that some of the hot, sour stuff from your stomach comes flying up your windpipe and sprays into the back of your throat. Usually it's just about a teaspoon (according to Lance's estimate), but it can ruin your whole day. Especially when it tastes exactly like something you ate the day before." Now, this isn't my favorite book of the year, but I think it's a good choice for the right kid. I think 3rd who enjoy goofy mysteries with action and a quick wrap-up will enjoy it. I can see it working for reluctant readers because of its humor, action and short chapters. Give it a try and let me know what you think of it! Find this series at the Berkeley Public Library (look in their paperback section) and the Oakland Public Library, or at Amazon. If you like audiobooks, you might want to give this a try. The first 3 books in the series are in one audiobook. Find it at Amazon for $20. We are in the middle of an amazing trip to the Sichuan Provence of China. The first part of our trip focused on seeing the Giant Pandas at the Bifengxia Panda Base Research Center in rural Sichuan, and at the Cheng Du Panda Breeding and Research Center. Both were amazing visits. Since my last review was about a children's book on pandas, I wanted to share just a little information. The Chinese are putting a lot of resources into developing research and breeding centers for the Giant Pandas. The Wolong Panda Center was heavily damaged by the enormous earthquake in May 2008. Most of the pandas at this center were transferred to the Bifengxia center. The panda above was the first we saw. I am surprised how well the researchers have learned to breed the pandas. We saw about nine young pandas (six months old) at each center, and many more one and two year olds. The young pandas are kept first with their mothers and then in a group together. Here, you see a panda with its mother in the Cheng Du center. We called this next picture "Bamboo Bar". We were watching a young adult happily eating, when we looked down below the fence and saw these three pandas sitting in a row munching bamboo. It's been an amazing journey. Thanks for letting me share.